Emeryville retail workers are campaigning for new rules that would change how businesses schedule employee shifts. Cinthia Nucamendi said her unreliable work schedule interferes with her schooling and family life. 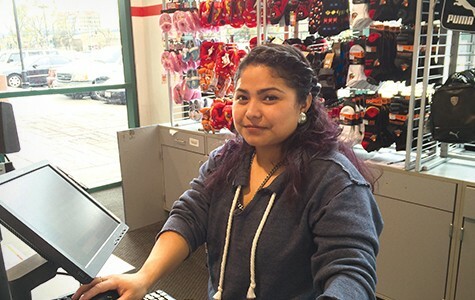 Cinthia Nucamendi recently purchased a car to get to her job at DB Shoes in the Powell Street Mall in Emeryville, and to transport her younger brother to and from his school. But her employer has kept her on an unreliable work schedule with too few hours that causes her to run low on money. As a result, there have been times she has been forced to choose between making payments on her car, and buying groceries. Her job's unpredictable hours, and the demands of her bosses, are the source of intense stress for Nucamendi. Recently, her manager asked her to come to work an hour early, giving her only five minutes notice via a text message, she told the Emeryville city council at its March 15 meeting. And earlier this month, she was unable to make a critical meeting at her brother's school because of another surprise schedule change. "Because of my unpredictable and unreliable schedule, I am forced to choose between giving up important personal matters in my life with my family, or make money to be able to make ends meet," she told the city's leaders. Nucamendi is not alone. According to a recent survey of more than one hundred Emeryville retail and fast-food workers, unpredictable schedules are hurting working families. "They have chaotic work schedules that don't allow them to plan for their lives," said Jennifer Lin, deputy director of the East Bay Alliance for a Sustainable Economy (EBASE), one of the organizations that issued the report. The survey found that 68 percent of Emeryville's retail and fast-food workers are working part time, but two-thirds want more hours, and 80 percent have schedules that fluctuate week-to-week. The study also showed that more than half the workers were scheduled for back-to-back closing and opening shifts — called "clopenings" — leaving them fewer than eleven hours for rest, commuting, and family time. After testimony from Nucamendi and other workers, the majority of Emeryville's city council members told the city attorney they wanted to make a study of worker-scheduling policies a high priority. The city's interest in addressing hours and scheduling issues faced by its service sector workforce follows on last year's minimum wage increase. Last June, Emeryville raised its municipal minimum wage to what was then the highest in the nation: $12.25 an hour, or $14.44 in workplaces with more than 55 employees. But Mayor Dianne Martinez said the testimony of workers like Nucamendi made it clear that increasing the minimum wage has not done enough to lift up Emeryville workers so that they can afford to live in the region. Because so many are working part-time schedules, their higher pay isn't translating into a higher income. "We want to do what we can," said Martinez. San Francisco adopted a city policy on scheduling last year, said Lin, and other cities, including Washington DC and Seattle, are considering the idea. "It's the next wave of issues to address income inequity," Lin said. Retail schedules are chaotic because many retail and fast-food outlets operate with what Lin described as "bare minimum staffing," calling in workers as needed, and sending them home on slow days. "We're focusing on large corporate retail stores because those are the ones that have the resources and profit margins to do this easily," Lin said about policy changes her organization is proposing. In an interview, Nucamendi explained how this scheduling pattern affects her life. She is a full-time student and has been the primary caregiver for her younger brother, now twelve, since he was born. Both her parents work so many hours that the job of caring for her brother fell to her, starting when she was in middle school. "It's kind of crazy with the schedule changes," she said. "They were cutting [my] hours, but I needed the money to support my family." As she juggles school, work, and home responsibilities, she said one of the main things she needs is more certainty with respect to the hours she is expected to work. "It would really help me so much to plan everything out because now it's just so stressful." Nucamendi said she has never refused extra shifts. "I'm afraid when I do need the hours, they won't give them to me," she said. 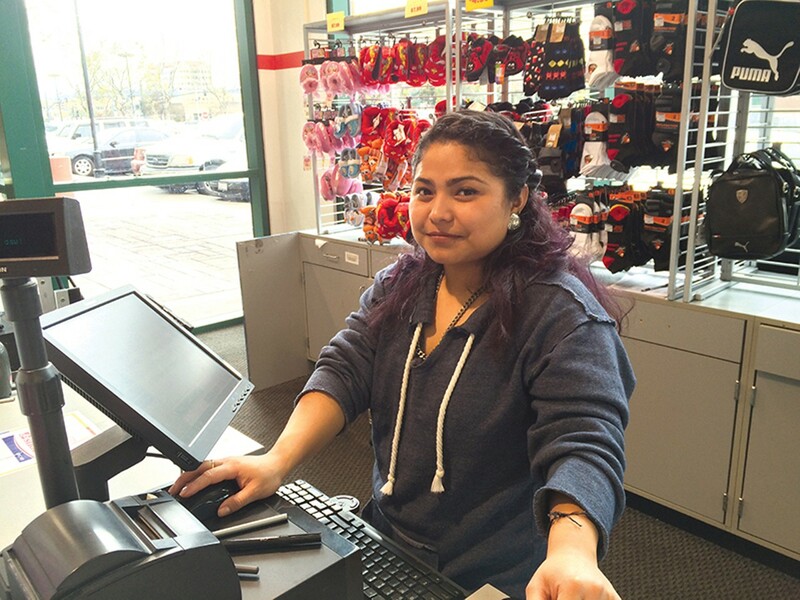 She has finally persuaded the store to give her a regular schedule, she said, but when she started her training as a medical assistant, her manager scheduled her on days she needed to study, and she failed the first-week final exam as a result. During the whole first week, Nucamendi only had one day to do homework. "I went three days without sleeping. Running on Red Bulls," she said. Alejandra, another Emeryville retail worker who didn't want to give her last name or identify her employer, works in the Bay Street Mall. "We have an app where we check the schedule," she told the city council, "but sometimes they add a day and don't let me know. You don't get used to having a routine that works." Alejandra has also experienced the "clopening" shift: "I would close at 10 [p.m.] and have to be back there at eight in the morning. You feel so tired. I don't understand why it has to be so bad. They've been understaffed most of the time I've been there." ACCE and EBASE gave the city council a list of policies they said would help: post schedules at least three weeks in advance, give current workers first dibs on additional hours so they would have a greater opportunity to work full-time, allow workers enough time to rest between shifts, and allow workers to request schedules and refuse unfair schedules without retaliation. "These policies would interfere with our store making a schedule," said Javier Lopez, a manager at the Marshall's store in the Powell Street Mall. He said Marshall's already posts schedules three weeks in advance, lets workers request schedules, and lets them refuse shifts without retaliation. But he said his store does schedule the same person to close at night and come in the next morning, and Marshall's also frequently calls employees at the last minute to fill in shifts of other workers who call in sick. "Schedules fluctuate because this is retail," said Phil, an assistant manager at an Emeryville retailer who did not want to give his last name, nor identify his employer. "Certain times are busier than others, it depends on the season." Other managers contacted for this story declined to comment. Emeryville's Mayor Martinez, who made retail scheduling a key point in her last state-of-the-city address, said that after the city passed the minimum wage ordinance, some employers complained that they had not had enough input in the new law, and that the council hadn't held enough community meetings. As a result, the city is approaching the scheduling issue more carefully. "The city staff want to take a neutral approach, dig into everything, really study how this has worked in the only city where it's been done [San Francisco]," said Martinez. The next step, she said, is a study session in which city staff will present their findings to the council. Officials will continue to meet with workers' advocates and also with employers. "It's going to take some time to do it right," said Martinez. "Just the fact that they did make it a priority gives me some hope," Nucamendi said. "As retail workers, we cannot keep doing this. If you want effective workers, you have to meet us halfway. It's not like we're asking for a lot – just things anybody would want."